Carlton Dry is a super refreshing, full strength lager specifically brewed for easy drinking. This beer has a great taste and a smooth, dry finish without the bitterness of traditional beers. I’d tear the bowack of any man for a stubby of dry. 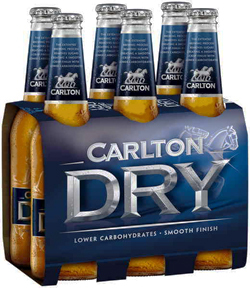 Got love Carlton dry..few of these and you'll take the shirt of any mans back..
Having spent the last ten years in Australia, I can recommend Carlton Dry to anyone.